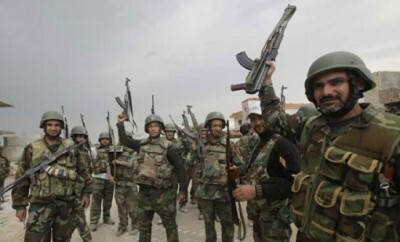 The Syrian Army and its allies have clearly turned the tide in the Syrian war. The “facts on the ground” have changed dramatically for all the major players, and constitute a major reversal for all the forces that have tried to institute “regime change” in Syria, in violation of its sovereignty. The Geneva “Peace Conference” opposition delegation, composed of marginal figures representing a tiny fraction of the armed anti-government factions but ostensibly speaking for all of them, is now largely irrelevant. As the terrorists and foreign mercenaries and their families flee Aleppo, thousands or tens of thousands of Syrian civilians are returning to their homes in secure government held areas. Given the reversal of fortunes for Turkey, Saudi Arabia, the US, NATO and their allies and mercenaries, what’s next? The sensible thing would be for all the actors to declare victory by finishing off the ostensible terrorist enemy and accepting a face saving solution that includes a Syrian government commitment to reform, with expertise provided by a friendly international team of experts that puts Russia, the US, Europe, Iran and perhaps even Saudi Arabia on the same side. But this is not the advice we are hearing from the advisers that got us into this mess in the first place, and who are disappointed that Syria might not go way of Iraq, Libya and Somalia after all. They are suggesting that a more and bigger war is the way to complete the job of turning Syria into a failed state. Such a war would involve an invasion of Turkish forces amassed and poised on the border, direct intervention by Saudi forces, US and perhaps other NATO ground forces, and potentially Israeli forces as well. Such a plan risks putting these forces directly in confrontation with Syrian and Russian units and objectives. It is a recipe for great power confrontation on a scale rarely seen since the Cuban missile crisis in 1962. Rarely, but not totally. When Turkey shot down a Russian aircraft on November 24, 2015, only very cool Russian heads prevented the unthinkable by deciding that the Russian response might best be served cold. That dish is now on the table, and it is for the Turks and bigger warmongers to decide if they want to risk Armageddon by unleashing even greater forces of destruction. There are players that would love to do so; they profit from death, misery and cataclysm, and would never miss such an opportunity. Chief among them are the arms merchants that dominate in the US and Israel, the neoconservative movement, also heavily subsidized by Israel and its Zionist lobbies in other countries, and by Israel’s investment in weakening all potential adversaries. Saudi Arabia has decided that it has much the same adversaries and has therefore thrown its lot in with Israel. The Erdogan administration in Turkey finds that its interests, including territorial aggrandizement, are congruent, and US objectives are defined by the neoconservative movement and the Israel Lobby, which have kidnapped US strategic policy in this regard, to the dismay of the Foreign Service, intelligence and military professional core of the American government. The Syria Solidarity Movement suggests that further escalation is not a solution, but that the application of international law can bring the hostilities to a close. Astonishingly, this a war in which there are few declared enemies. Of the many parties and their sponsored combatants, only the armed groups and the Syrian government have declared themselves to be enemies, unless you count the insincere protestations that “terrorist” groups are also enemies of the same nations that are aiding and abetting them. Syria is still recognized universally and diplomatically as a sovereign state, and under international law no power may interfere in its security considerations except by invitation from the recognized government of that state. To seek “regime change” (overthrow) is strictly illegal under international law, and prohibited by the United Nations. Governments that are pursuing such an objective should be sanctioned by the UN, although there is no realistic possibility of such action. The Syria Solidarity Movement believes that it is time to complete the expulsion of the terrorist and mercenary forces that have been attacking Syria for the last five years. This can be accomplished by denying all support of arms and funding from the US, Europe, Saudi Arabia, Turkey, Israel and other countries. In addition, these countries can choose to either cooperate with the Syrian government and its allies to rid Syria of this scourge, or at least not interfere while Syrian, Russian and other allied forces complete the job. In this case, Syria can resume its role of providing government services and representation for its people, and its people can resume shaping their own government without outside interference. It time to end this ill-advised adventurism, and to put to flight the rascals and criminals, not only in Syria but also inside the countries whose strategic policies have been hijacked by gangs who are in many respects worse than those who bring beheadings and crucifixions to our computer screens.